New York - When the space shuttle programme was in full swing, even the tiniest fault could have devastating results. But as the iconic spacecraft head for retirement, they no longer seem to be treated with the same extreme caution as in the past. 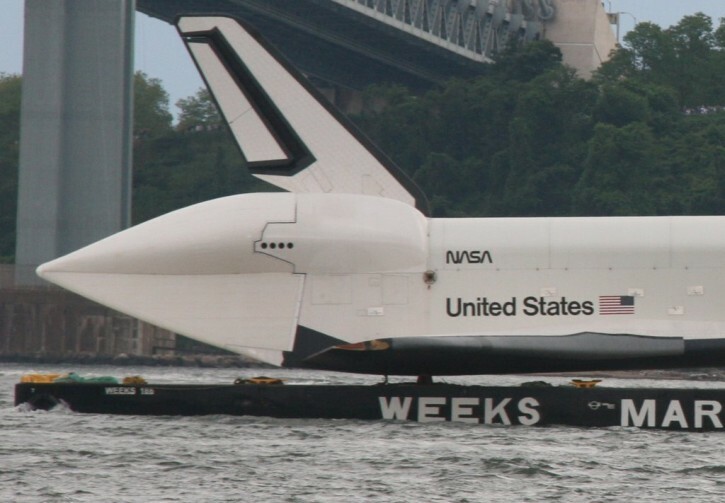 On Sunday, the shuttle Enterprise was damaged after colliding with a bridge in Jamaica Bay off the New York coast. The damage, which was apparently the result of 40mph winds, is believed to be only ‘cosmetic’, according to an expert who witnessed the crash, and has not affected the shuttle’s interior. Lol. Its become more like an idol. The Enterprise was never intended for flight. Bunch of idiots, also it looks like the barge is sinking, what are they thinking?? All barges run very low on the water when fully loaded. Welcome to NYC , park your car once and it gets damaged . NASA Stands for - Need Another Seven Astronauts !!! How is that in any way appropriate? Who cares? The Enterprise never flew under its own power and never had engines. All damage to it now is merely cosmetic. As soon as it comes to rest near the Intrepid, it'll get a parking ticket! Twelve American astronauts landed on the moon, and returned safely to earth, from 1969-1972. The Russians were beaten to the moon. Afterwards, NASA wasted billions upon billions with trips to the space station. How have the trips to the space station with the shuttle benefited mankind? The next President should abolish NASA, and let private enterprise engage in the exploration of space. There are enough problems on earth, without wasting additional money on questionable space probes.